After the fourth or fifth crash-and-burn attempt to get up on the board, I thought the day had the potential to be a complete washout, one of those best-of-intentions-but-you’re-out-of-luck episodes that would long be talked about in hushed tones around the office, the video of which would include 20 different slow-motion clips of my face and backside connecting with the water, perhaps to the “Benny Hill” theme music. 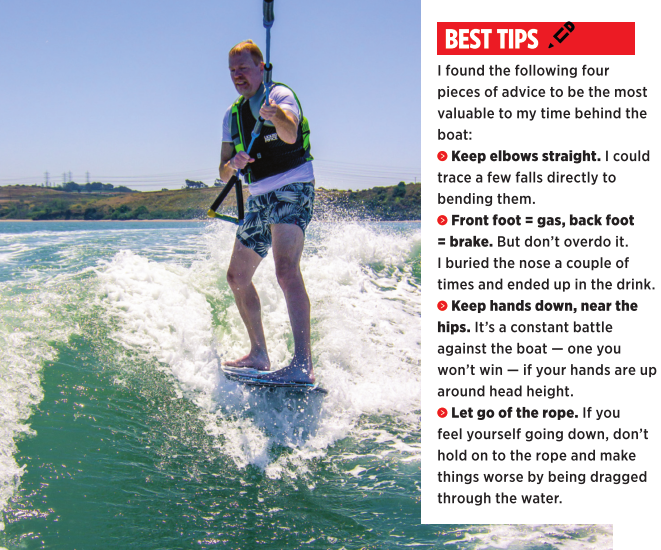 My first wakesurfing lesson was not off to a great start, but it wasn’t my instructor’s fault. Everything Zak Mager of California Watersports at Carlsbad Lagoon told me made sense, and every time he made the slow approach to pick me up for another try, I could pretty much tell him what I had done — and it was in direct contradiction to what he had told me to do. One time, I bent my arms and pulled myself toward the boat. The next, I leaned way too far forward and lost my balance. Another time, I forgot to turn the board parallel to the wake. Eventually, the guidance sank in. The best piece of advice Mager gave me, one I was able to use every time I got up (yes, I got up more than once), was to consider your front foot the gas pedal and your back foot the brake. To go faster, put more weight on your front foot; to slow down, move your weight back. First, however, I had to get up. Lying on my back in the water, my feet were spread about shoulder width apart with just my heels resting on the Liquid Force board, which was flat on the water. (It’s going to seem unnatural, and you’re going to want to put your feet flat on the board, but don’t.) The tow rope was between my feet, the handle in my hands. 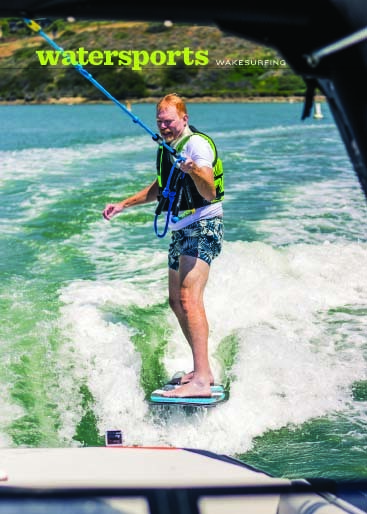 As soon as Mager hit the throttle on the Axis Wake A20 and we started moving, the board pressed against my feet and became a plow for a few seconds, providing the resistance to get me moving upright. Coming out of the water, it’s important to keep your arms straight and your knees bent. If you’ve ever been sitting on the ground and had someone help pull you up by your hands, you know the mechanics of it. Someone else compared it to being helped out of a chair. Either way, your body should move as one entity, not disparate parts. As soon as I was upright, or nearly so, I bent my elbows, which is a no-no. As the boat pulls you up out of the water, keep your elbows straight; bending them only succeeds in pulling your upper body forward too far. Thomas, who got my board ready for me, said, “No matter how strong you are, the boat is stronger. Let the boat do the work.” Once I better understood how to let the boat do the work, I was up. Start with just your heels on the board and let the boat’s motion push the board flat to your feet (left). Once you’re up (center), try to keep your arms straight, get the handle down around your waist and get the board turned in line with the boat–one outta three ain’t bad. After that, it’s all about finding the sweet spot. Over the course of several more runs — my aching 45-year-old muscles would say a few runs too many — getting up and turning the board got easier, using the gas and brake didn’t take as much thought, and pulling myself forward on the rope didn’t cause panic. But finding the elusive sweet spot was, for me, like searching for the Holy Grail. I would get tantalizingly close, where the rope would go slack for a few seconds and it was obvious the water was moving me instead of the boat, but I couldn’t maintain my position there long enough to give up the rope and ride the wake unaided. No matter. Next time I won’t spend a big chunk of the lesson worrying about getting vertical, so I’ll have more time and energy for finding the point where wake and wakesurfer become one and enjoy the endless wave.